A couple of months ago, I got a really cool watch at Sears. It's a Structure Military-style Watch and costs about $30-$35. 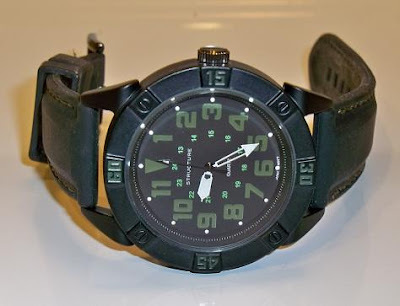 A classic military dial looks just and diver-style non-rotating bezel makes for a perfect look. It also has a silicone band that is super comfortable and looks like leather.